Greetings! Spring is here for many in the country but in the northeast we are blooming late. Many new items have arrived in the shop, and Woodland Glen is one of those beauties that fits with the Pennsylvania landscape greening up in the spring. 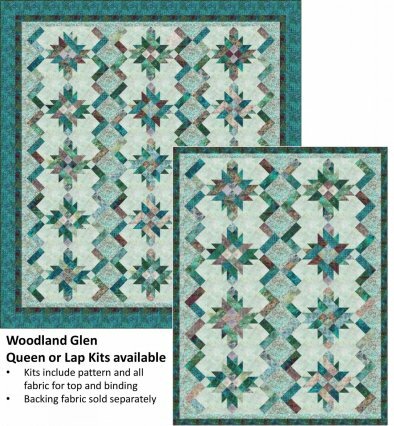 Woodland Glen created from the Robert Kaufman Regal Batik Collection is a beauty that is fun and easy to create. Kits and select fabrics and 2 1/2" rolls available. Kits available in Pink or Aqua, both in Queen and King Sizes. The digital layouts of these quilts simply do not do justice to the beauty of this RJR Fabric collection by Flaurie and Finch. This bed size quilt is the perfect design to showcase the collection and because of it's soft colors you can choose to finish with an edge to edge quilt pattern or showcase the open spaces with custom quilting. This is one of my recent favorites and a huge favorite of everyone lucky enough to see it in person. I looked at this gorgeous array of batiks and knew I had to break it into two distinct color ways so I set myself to the creative task of designing a pattern that incorporated the collection. 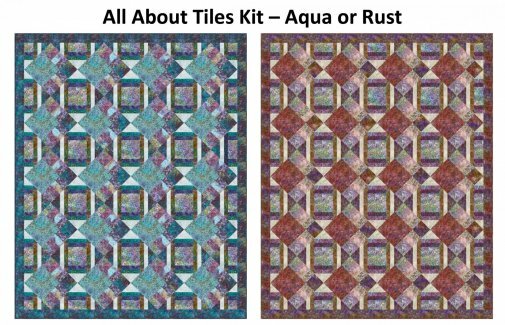 This creative pattern encompasses strip piecing sets, squares and triangles in two unique blocks which played into a beautiful tile effect. 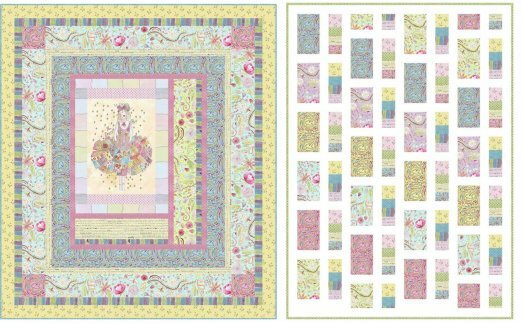 This joy filled spring collection of fabrics from Laurie Heine and Free Spirit are delightful. I personally love Laurie's beautiful collage designs but in lieu of not having enough time myself to dive into something so labor intensive, I couldn't resist designing a couple of quilts from The Dress which are both equally fun and simple to sew - Artistic Endeavor to the left and All About Friends to the right. 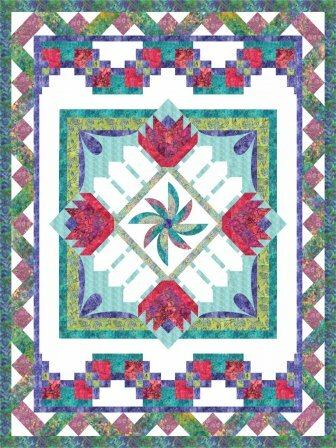 If you fell in love with my Block of the Month - Enchanted Arbor, this beautiful batik kit is now on sale for 25% off. Kit includes all 6 patterns, plus fabrics for quilt top and binding. 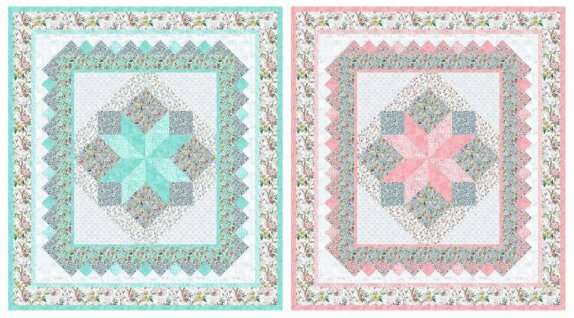 It's not too late to create a beautiful quilt from the Heather fabric line by Maywood Studio and Jennifer Bosworth. Looking for a fun and quick gift. 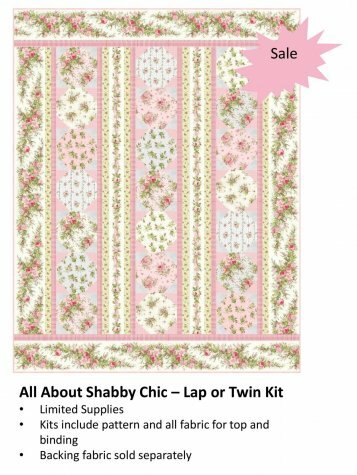 All About Shabby Chic is a sweet and simple quilt that utilizes the border design perfectly. Click here or to join me on Facebook. It's a great opportunity to connect with questions you have and simply share the love of quilting. I will be showcasing projects and you are free to join me with anything you are creating from over 100 patterns that I've designed. We would love you to inspire us all and if you are scared to start with something, it's a perfect opportunity to ask for help from me or someone who may have already sewed the project.